Fishing for the biological effects of contaminants present in the aquatic eco-environment relies, in many instances, on a fish-based model system – the tiny zebrafish, famous for the transparency of its embryos and the remarkable abundance of different transgenic lines. These lines express fluorescent proteins in specific cellular types, or during specific biological processes – because of embryo transparency, the fluorescent, glowing proteins can easily be visualized to detect changes resulting from chemical perturbation. Last April, a paper published in Nature unveiled a long-awaited, high-quality annotated sequence of the zebrafish genome, thus boosting the research value of the zebrafish model. 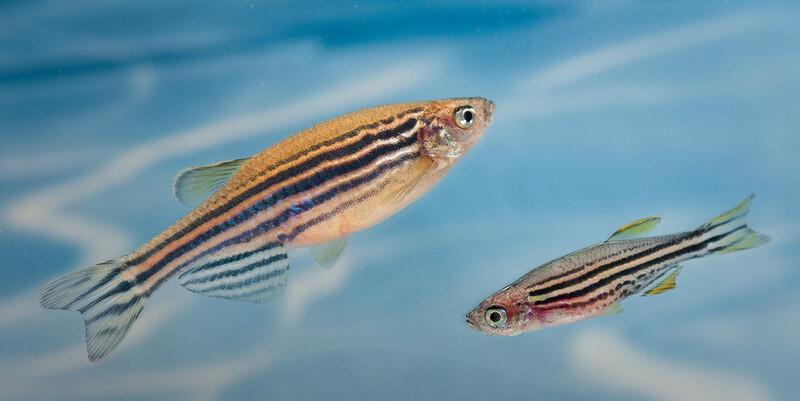 The paper revealed that about 70% of protein-coding human genes are related to genes found in the zebrafish, and that 84% of genes known to be associated with human diseases have a counterpart in zebrafish. It’s not surprising that this relatively inexpensive model is being used with increasing frequency in a variety of studies involving the detailed characterization of gene function and human genetic diseases. This model is used for the toxicological monitoring of heavy metals, endocrine disruptors and persistent organic pollutants, which cause characteristic changes in gene expression, morphology, physiology and behavior, and therefore serve as biological indicators. However, as discussed in the article, models based on wild-type zebrafish have several disadvantages, a major one being the low detection sensitivity. Although transgenic zebrafish models represent a more advanced system for monitoring environmental pollutants when compared to their wild-type counterpart, additional improvements could lead to the full exploitation of the zebrafish potential for toxicological evaluation. What could be done, then, to enhance the zebrafish model so it can become a true powerful ally of environmental toxicologists? Dai and colleagues suggest one major point for improvement – the use of adult, fully transparent zebrafish. Unlike embryos, the adult zebrafish is opaque. The fluorescent, glowing proteins so easily visible in the transparent embryos show up only minimally in adults, causing low sensitivity in detecting signals that reveal chemical toxicity. A transparent zebrafish line is currently available – it is a mutant developed in 2008 in which fluorescent tissues and organs are directly observable. In addition, Dai and colleagues support the development of novel response elements – short sequences of DNA present within a gene promoter that bind specific transcription factors, and thus regulate transcription of genes. The development of novel response elements, along with recombination of existing response elements and optimization of the number of response element repeats, would allow highly sensitive monitoring of multiple chemicals at the same time. As of now, most zebrafish-detection systems can identify only one pollutant or one class of pollutants present in the environment. Different specific response elements would allow simultaneous expression of different fluorescent protein genes – each with a different color (for example red, green and yellow), thus allowing analysis of mixtures of chemicals in transparent, adult zebrafish. The potential of the improved zebrafish model proposed by Dai and colleagues is high, especially in view of the high numbers of pollutants present in the aquatic eco-environment and the increased importance given to the detection of biological effects induced by mixtures of chemicals. This entry was posted in Toxicology and tagged environmental pollutants, fluorescent proteins, transgenic zebrafish, zebrafish genome on January 3, 2014 by Integrated Environmental Assessment and Management. Thanks for this article, it have broaden my understanding the more…. Once again Thanks.